I use Inkscape to create some vector graphics, but I want any text on that graphic being compiled by Latex. Therfore I use the option of Inkscape to create a seperate .pdf_tex file which contains the text information. What is the general workflow to avoid such problems? I really want Latex to compile my texts as they contain a lot math symbols, however I don't want to place them manually with \put(x,y) just to get them at the right position. Where graphic.pdf_tex is an Inkscape image with a circle and some latex math formula in it. Use the text tool to enter some text. Click the align center button (for text). Use the Align and Distribute panel to align the text in the middle of the circle. Some examples where aligning text will improve the aesthetics include right-aligning labels on the y-axis of a line chart and centre-aligning labels on the x-axis. Do not forget to left-align when necessary. This workflow will not be able to accurately centre the text vertically because, as the comments state, Inkscape has no way of knowing the size of your text. Although it is not ideal, you should be able to adjust the vertical positioning with relative ease. 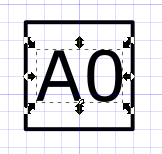 There are (at least) two ways to specify the alignment in Inkscape. If you set the alignment from the top toolbar with the text tool and some text selected, the alignment gets applied to the tspan node in the XML and you it does not get centered in the LaTeX. Then you can set the centering property of the text node in the "Text and Font" inspector pane that comes up with shift-ctrl-T. This at least fixes the horizontal centering, though it doesn't address vertical centering. One workaround that works for me is to format the svg's text in Latin Modern Roman font and with the size that will be used in the document later (e.g. 12pt). In draw.io, the font is called LMRoman. This places the svg text at a position that works for that font. When you export to pdf + pdf_tex, the text will be correctly vertically aligned. How to ensure the text position importing a draw from Inkscape?